These are so nice! They come in many shades from sea green to pink but I just got 2 shades~ White and Grey. Swatches coming up. oops.. i mean how're you supposed to use the roll-on fonda properly..looks compliacted if you ask me..
i got the one in white too about two weeks ago. 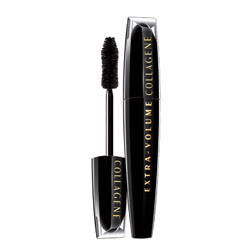 the liner tends to flake near my eyelashes but works pretty well. the price is definitely inviting! 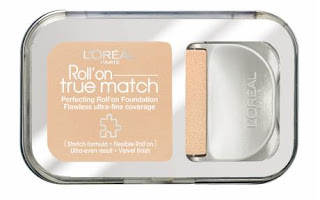 I tried this roll on foundation at the store. It looked nice ..
@Maki~ Don't know how to use it yet Maki :). Will do an EOTD sometime. May I return your same pinch for the liners?? hey all u ladies i need help!!!! i stay in Pune so please suggest an available brand which will be good for a first timer too! Oh yes we are very much excited :) G8t stuff.. I am waiting to try the roll on foundation too.. gel liners are g8t.. I have used coastal scents golden & pink. @ Neha.. Have u tried the oriflame gel liners?? I have ordered them too and should arrive by next week..
Those eye-pencils look awesome.. and yes we ll be waiting for the review of the roll on foundation! oooooooo... Now I should run !! I have been lemming for Maybelline eye studio range for soo long !! @Neha~ Mac is not in Pune, right? If not, u can check in those stores which sell a variety of cosmetics. U'll probably find some in those. Sorry, don't know about Pune much. The gel liner seems very sleek. I've been looking out for it but haven't seen it here yet. Urgh! When?! Wowo! I am going to pick that white liner soon. Pricing is tempting. I see new ladies here. If u have yr own blogs n r in my followers list pls make sure there are links to yr blogs k otherwise how will I visit?! =). I just love maybelline lipstiks..I've noticed the'color sensational' lipstick,while searching internet..i have been looking out for it but have not seen it here yet...when do i get it buddy?